White paint can do wonders for red (late 80's) brick! The same can be said for 90's oak cabinets. You guys already know this though! There is nothing groundbreaking about painting things white. We've been there, done that and bought the t-shirt. 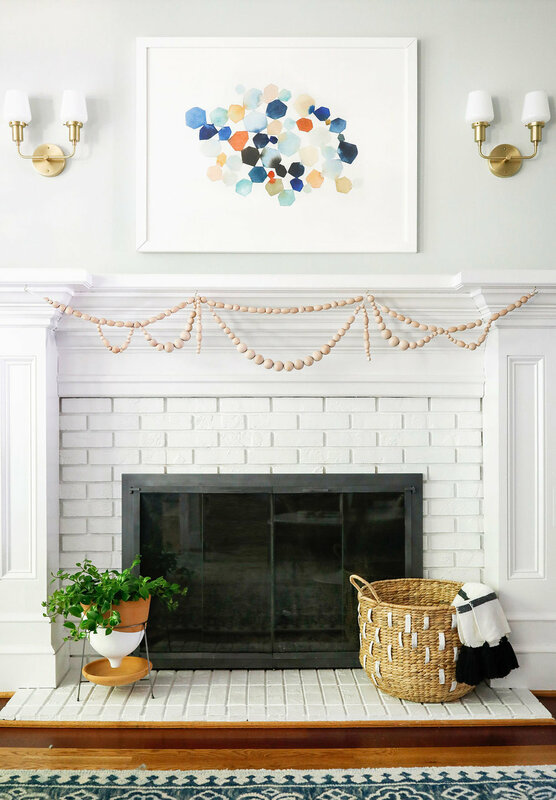 It works though and seeing before's and after's is basically my favorite, so let's dive into some white painting adventures happening in my home! That was our fireplace and mantle before we painted it. We didn't even live in the house then and I'm not hating on the previous owner's decor choices, but wanted to show how different just painting that red brick made the room feel. Now I know some folks out there are against painting wood and brick white. I get it. They probably have way older homes than we have and way more character in their home. Our home was built in 1989 and while it does have some character, its from the 80's and the changes (big and small) using white paint have made our home feel more happy and modern, which is generally what I'm aiming for. We were told that our cabinets (90's oak) were very good quality so we lived with them like that for several years. I really kinda hated them, but I tried to convince myself they were sort of 'Scandinavian inspired' lighter wood cabinets. haha. We paid a company to have them sanded down, sprayed Sherwin Williams Extra White and had the hinges replaced with white ones. I think it cost around $7500, so NOT CHEAP but soooo worth it (in my opinion)! We have a ton of cabinets which is part of the reason for such a costly endeavor. Replacing the cabinets would have cost much, much more so I have no regrets! It just feels so much happier in here. Granted, white is harder to keep clean especially with kids and a messy cook (my husband) but we manage. Its not my dream kitchen, but painting those cabinets made such a difference and I'm happy to cook and eat in here everyday! What do you guys think? Are you over painting everything white or still loving it? Let me know in the comments!